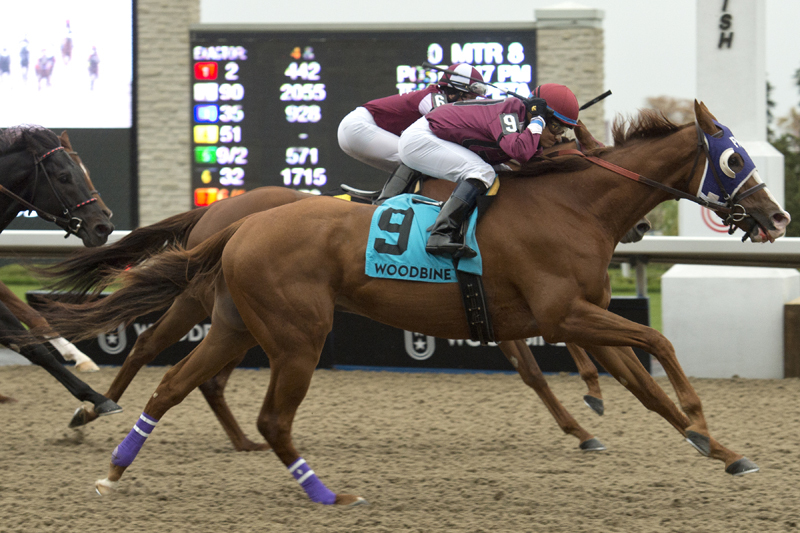 Thor’s Rocket launched his attack in the stretch and blasted from last to first for the mild upset in the $100,000 Overskate Stakes featured on Saturday’s program at Woodbine. Alan Garcia worked out the five-year-old gelding’s first winning trip in two years for trainer/breeder Paul Buttigieg, who also co-owns under Buttigieg Training Centre with Gus Vlahos. Thor’s Rocket defeated late leader and 6-5 favourite Pink Lloyd, who ended up finishing fourth in the seven-furlong Ontario Sire Stakes event when passed in deep stretch by the outside closers. Sweet Grass Creek set the pace through opening panels of :23.28 and :46.41 with Not So Quiet pressing to his outside and Eskiminzin stalking the top pair. Meanwhile, defending champion Pink Lloyd moved up behind Not So Quiet and then rallied three-wide coming off the turn to strike the front, but gave way to the three outside closers including the furthest out Thor’s Rocket, who had trailed the nine-horse field until the top of the stretch. Thor’s Rocket prevailed in 1:22.48 by a half-length over the supplemented filly Red Cabernet and three-year-old Silent Poet. The chestnut son of Old Forester, who last won the Vice Regent Stakes in October 2016, had finished no worse than fourth in six prior races this season. More recently in his last two starts, he hit the board in the longer OLG Elgin Stakes and was a neck shy of victory in the Bunty Lawless on the turf – both stakes won by Kingsport. Boreal Spirit finished fifth ahead of Kingsport today with Not So Quiet, Eskiminzin and Sweet Grass Creek rounding out the order of finish. Thor’s Rocket returned $15,70, $7.50 and $6 after pulling off the mild 6-1 upset. Red Cabernet ($19.90, $10.70) completed the winning exacta combination that paid $335.50 for a $2 ticket. With Silent Poet ($10.10) third and Pink Lloyd fourth, the $1 trifecta paid $1,166.15 and the $1 superfecta paid $5,229.10. Live Thoroughbred racing resumes on Sunday afternoon with the Grade 3 Ontario Fashion Stakes featured on the 1 p.m. program.